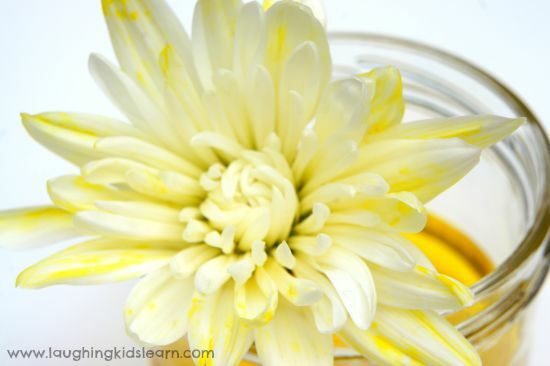 This will have your children observing a simple science experiment with colour changing flowers! 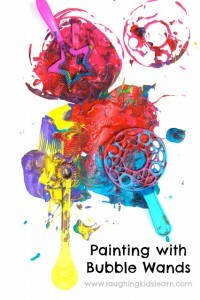 It is easy to set up and is a great lesson, especially for preschoolers. 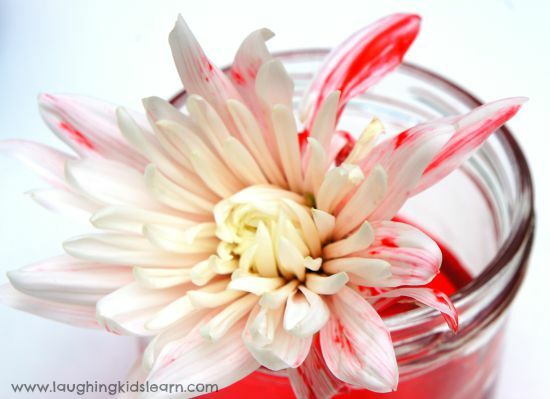 It helps children learn about how plants absorb water through its stem to nourish the head of the flower. 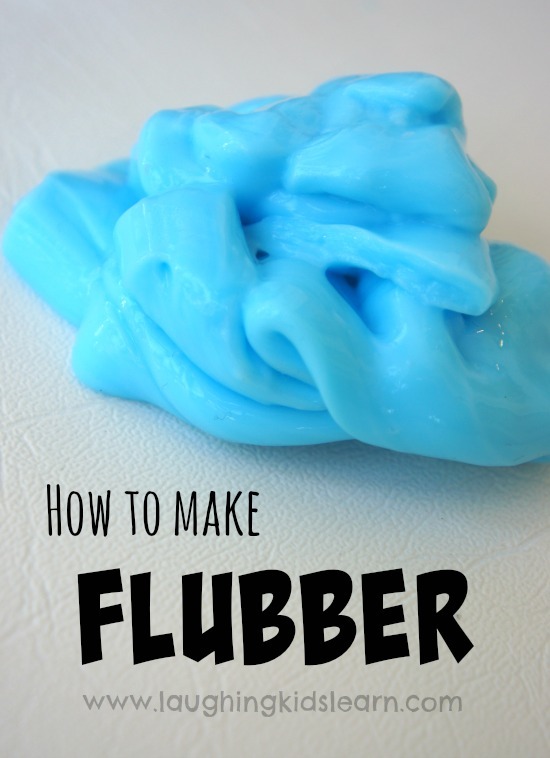 This is such a classic science activity that your children will absolutely love. 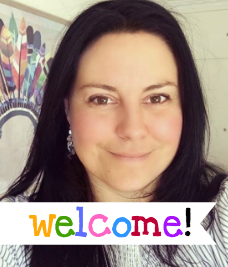 I loved doing it so much myself and watching the changes that seemed to happen within the hour! It only required a few materials to set up this science experiment and inspired Possum (aged 3.5 years) to learn more about plants and how they absorb water. 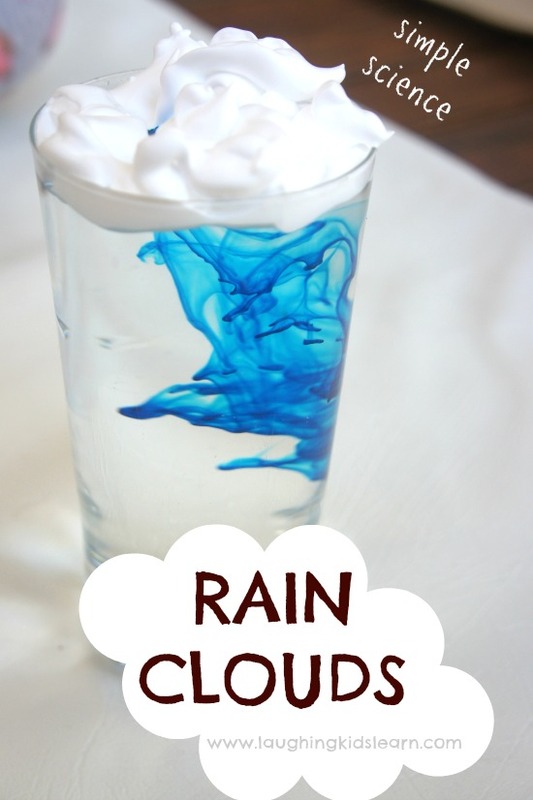 This activity is an amazing visual for kids. 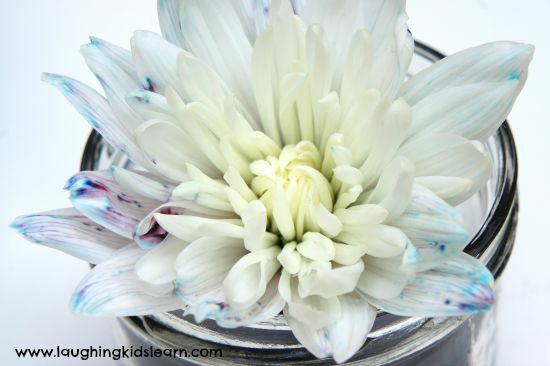 It teaches them how a plant absorbs water up it’s stem and nourishes its petals or leaves. 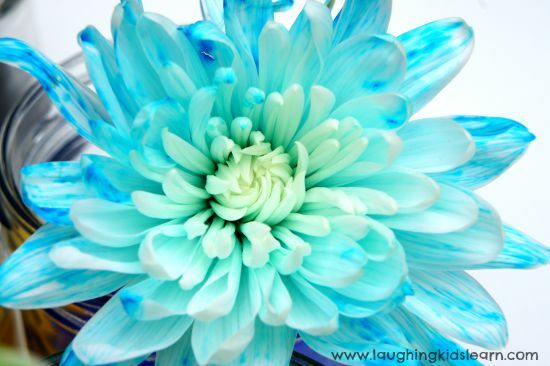 The brightly coloured water will transform the white flowers within only a few minutes. I used chrysanthemums, but you might like to use whatever white flowers you have available. Obviously some flowers may not absorb water as well as others. To set up this activity I simply used a collection of small jars. 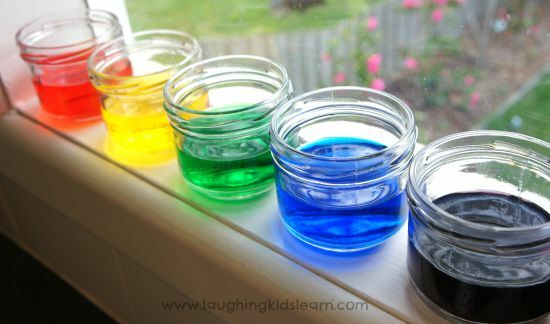 I added 1/2 cup of clean water and 10 drops of food colouring to each of the jars. Red, yellow, green, blue and purple were the colours I made the water. 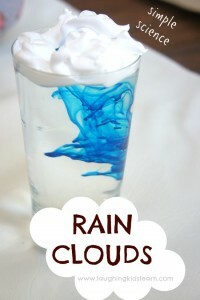 I didn’t have purple food colouring so I needed to create it using a combination of red and blue drops. Possum loved watching how the two colours, when combined, made a completely new colour. Quite simply, I cut the stem of the flowers so there was about 6 inches of stem remaining before placing one in each of the jars. I highly recommend ensuring there are no leaves left on the stem as it can go mouldy in the water, which will reduce the time you can keep this activity. Place your jars in a safe location that will gives them some lovely natural sunlight. We placed our on the kitchen windowsill. I wanted the end result to be a surprise to Possum and so I asked her what she expected to happen to the flowers over time. Some children may benefit from drawing their predictions. It’s also a great idea to do this because children can return to their initial predictions and make comparisons to the actual end result. 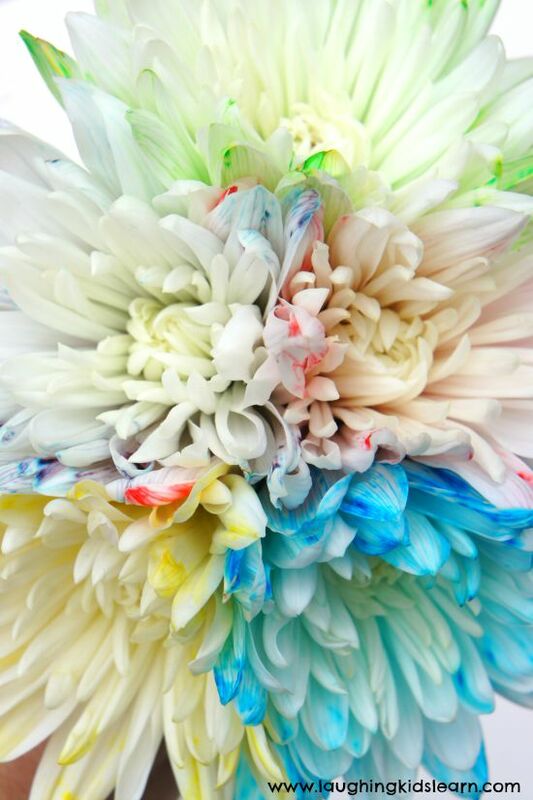 This is the result of the flowers absorbing the coloured water after one week. All of the flowers absorbed the coloured water and highlighted how it travelled all the way to the tips of the petals to nourish it. Mind blown. But what is even more surprising is that within an hour of us starting the experiment we were able to notice some changes to the white flowers. Amazing! Every three days I snipped off a bit of the end of the stem, which kept the flower fresh and absorbing water. I’m sure you’ll agree that the results we experienced in the colour changing experiment were absolutely amazing. It did seem like we had magical colour changing flowers. Possum loved watching the changes over the course of the week. One thing we did observe was that the flower in the purple coloured water didn’t absorb quire as well as the others. Still amazing, but less vibrant in comparison. 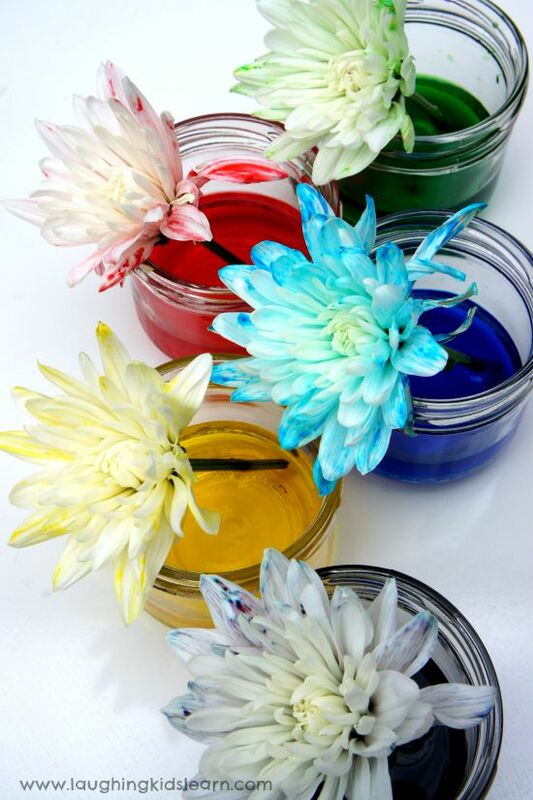 We also observed that the flower seemed to be able to separate the two food colours. We mixed them make the purple colour initially, but you can see how they separated above. Cool, right??? These beautiful flowers, at the end of the experiment, found themselves in some fresh clear water and on display in Possums room. Of course they were a great talking point for her and her friends that came over to visit her. This was such a wonderful science activity that I really encourage you to do with your own children. It really didn’t take much to set up and the changes can be observed within an hour. Your children can make predictions and record the changes by drawing what they see each day. It’s a great visual demonstration of how plants absorb water up their stem to nourish itself. I hope you enjoy this one. 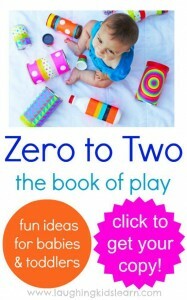 Do you think your child would find this interesting? Wow these look so colourful and my girls would love to do this activity! We have some white daisies out the front so maybe we’ll try it this week 🙂 Thanks for the inspiration Kate. soooooo pretty – and fascinating! 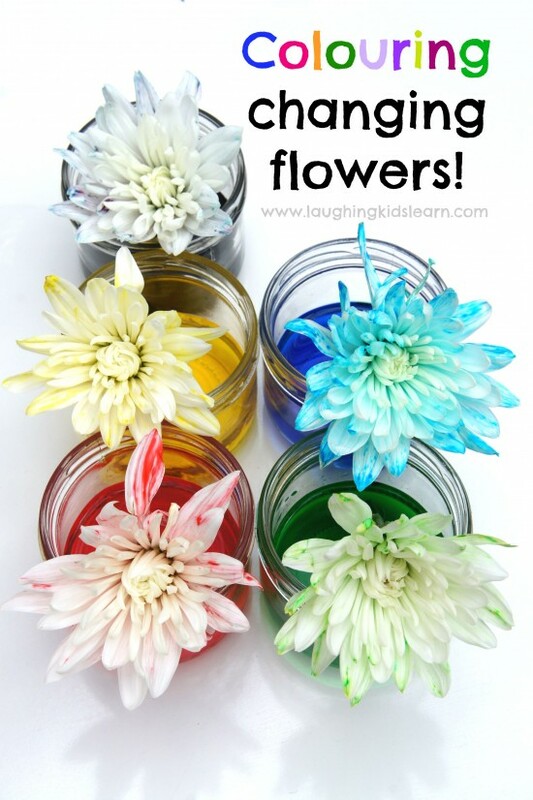 the kids have been asking to do this, so time to rustle up some flowers! Great Science experiment . Thanks to share . 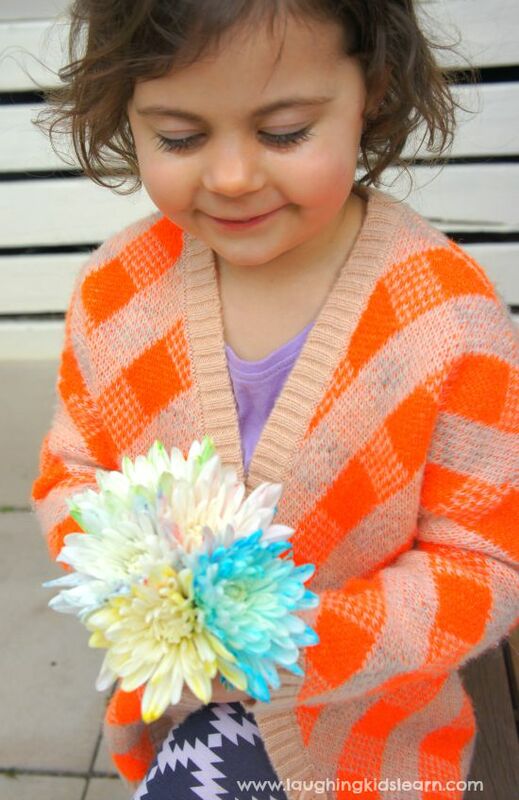 I love this timeless activity….the kids are always amazed by the results. Superb experiment ! Thanks for shearing this post. Not sure what went wrong but all our flowers died. Some took up a hint of colour but they all just shrivelled up like they didn’t even have water. 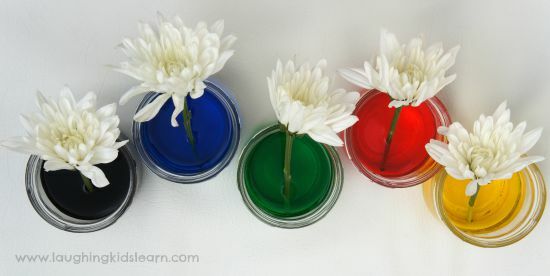 Just regular daisies, just regular food colouring..
I’ve been trying to do this experiment with my class but nothing has worked. 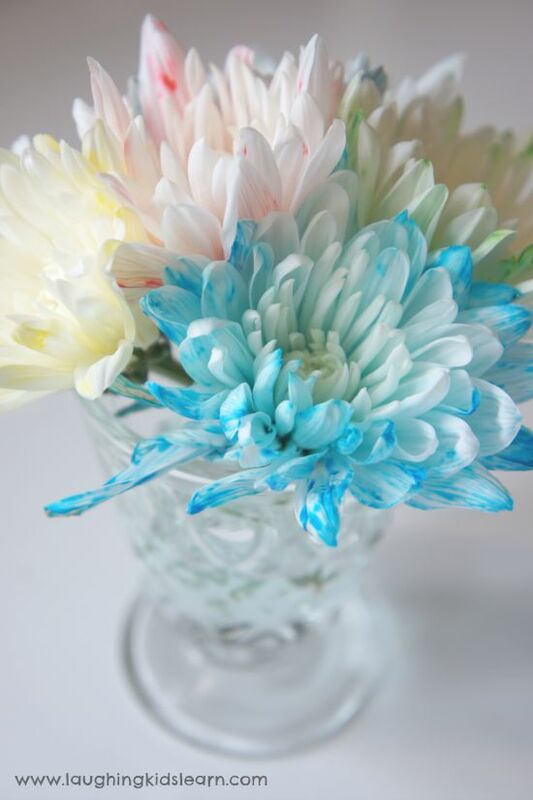 Tried different flowers, (carnations and chrysanthemums) different food colouring (colour and brand) different amounts of water to colouring ratio, I’ve tried snipping the stems up the middle too. Nothing going is working. Any ideas where I might be going wrong? How very strange Sarah! How long are you leaving the flowers in the water for? I make sure I have there there for a good number of hours, even overnight! That gives the flowers enough time to absorb the water. 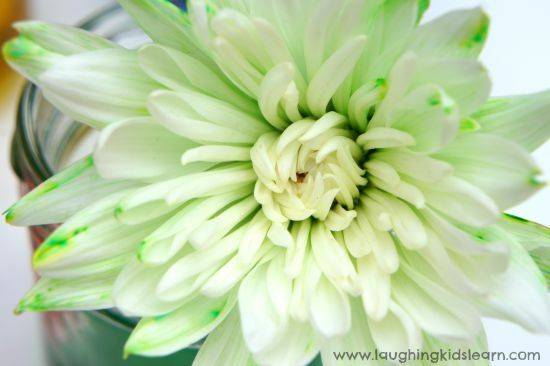 Are your flowers white? 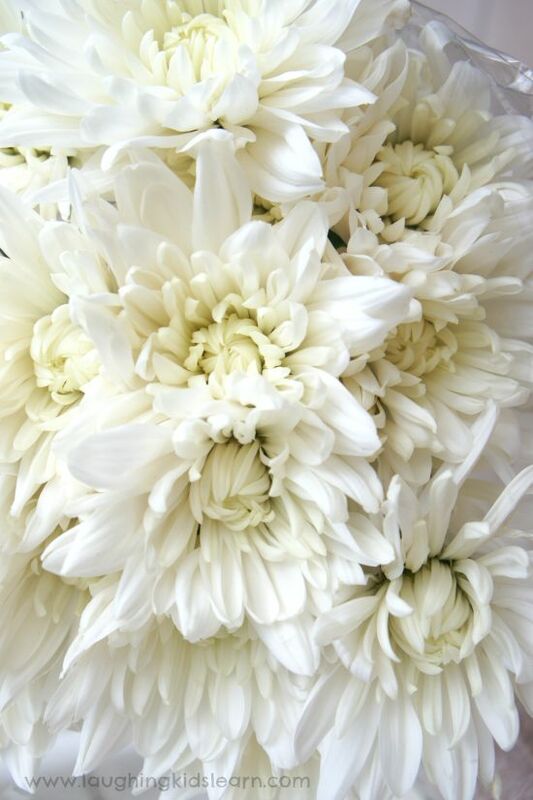 White flowers will show the strongest colour change.